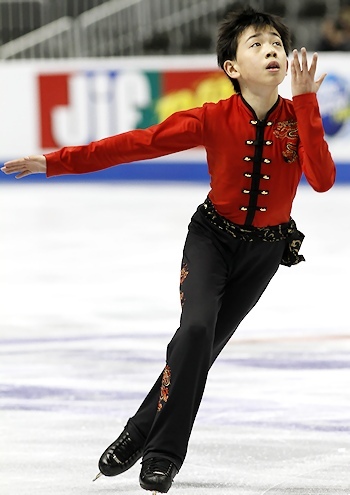 Vincent Zhou performs to "Iron Monkey" and "Rising Sun" at the 2012 U.S. Figure Skating Championships. The youngest competitor in the novice men’s competition—11-year-old hometown favorite Vincent Zhou won the competition this afternoon at the 2012 U.S. Figure Skating Championships. The 7th grader equaled his ladies counterpart and broke the record for the highest score at the U.S. Championships by a novice male. Zhou scored 164.96 points, landing five clean triple jumps along the way. The crowd was on his side from the start, wishing the Palo Alto, Calif., native to do well. Zhou, who skated to Iron Monkey by James L. Venable and to Rising Sun by Kiyoshi Yoshida, has a love of Legos and Nerf guns when he isn’t skating. However, like the little boy that he is, he gave his mom a hug and smiled sheepishly when she said she was proud of him. “He makes me very happy and proud,” she said. Finishing in a distant second place, was James Schetelich, who moved up from fourth place after the short program to capture the silver medal. Schetelich also landed five triple jumps in his West Side Story program, but the jumps weren’t as clean as the winner’s. Schetelich, from Scotch Plains, N.J., earned a competition total of 139.77 points. Finishing with the bronze medal was another 15-year-old, Spencer Howe from Woodland Hills, Calif. After finishing in fifth place in the short program, Howe was confident that he could move up in the free skate. Howe finished the competition with 134.22 points. Slipping from second place after the short program to fourth overall was another local skater, 14 year-old Piedmont, Calif., native Kevin Shum. The pewter medalist popped three jumps in his Nauscicaa of the Valley of the Wind program, and earned 132.68 total points.